Paul Raymond, guitarist and keyboard player with UFO, has died at the age of 73. The news comes just eight days after UFO played their final UK show at London's Forum. Raymond's death was confirmed by his life partner, Sandra, who posted the news on Facebook, writing "With a desperate and broken heart, fully in tears and pains that feel like they will kill me I have to tell you that my most beautiful and beloved darling Paul Raymond has passed away today. "The doctors we're trying to reanimate him and with success at first but then his system shot down again and there was nothing more they could do for him, he died of a heart attack. "He absolutely enjoyed the last couple of weeks touring with UFO in the UK & Ireland and he was looking forward to the rest of this year's tour. "I will always love him and I hope he will rest in piece until I'll see him again on the other side!!!" "I love you so much Paul." 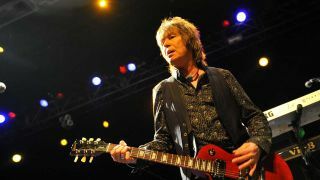 Paul Raymond first joined UFO in 1976, and played on the classic albums Lights Out, Obsession, and No Place to Run, and on the legendary live album Strangers In The Night. With four different stints in the band, he had been a regular fixture in the lineup since 2003. Previously, Raymond had replaced Christine McVie in Chicken Shack after she left to join Fleetwood Mac, and was also a member of Savoy Brown. He also played with former UFO guitarist Michael Schenker in MSG, and with another UFO veteran, Pete Way, in Waysted. Way posted on Facebook, "I've just heard the sad news of Paul Raymond's passing. I won't pretend that we were always the best of friends but I am completely shattered to hear this. "My sincere condolences go out to his family, particularly Sandra. "I'm gonna miss you mate! Sleep tight." On Twitter, Saxon posted, "We are shocked & saddened to hear the news of our friend and touring mate Paul Raymond of UFO's sudden passing today. RIP Paul." DJ Eddie Trunk tweeted, "Shocked and saddened to wake up to the news just now that Paul Raymond of @UFO_rockband has passed away. Paul was a great guy, great musician, and part of the bands current & classic era. RIP Paul. UFO’s final shows will not be the same without him." UFO have a series of European festival dates lined up in June and July, with a US tour in October, and a final show booked on 2020's Rock Legends Cruise, which departs from Fort Lauderdale, Florida, in February.